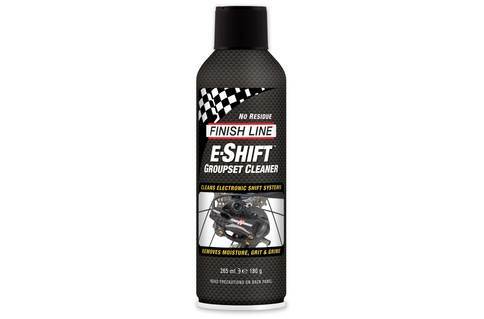 buy Finish Line E-Shift Groupset Cleaner online now from Arthur Caygill Cycles. We currently have Finish Line E-Shift Groupset Cleaner in stock. If you have any questions about Finish Line E-Shift Groupset Cleaner, please get in touch. 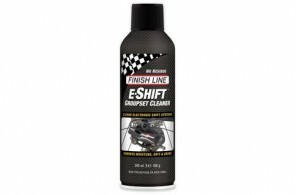 The Finish Line E-Shift Groupset Cleaner - 266ml, is the perfect cleaner for those sensitive components, electronics and wires. With E-Shift there is no need to worry about damaging wires or derailleurs, cleaning away the grit, grime and old lubricant with its state of the art formulation quickly evaporates with no water rinsing required. Parts are left completely clean and completely dry in minutes. This product will ensure these parts are well looked after, preventing premature wear and keeps components running at peak performance a great investment for your bike cleaning regime.